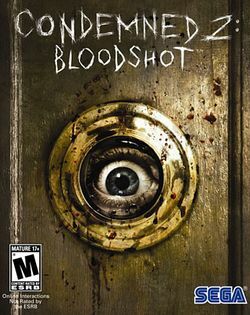 Condemned 2: Bloodshot (entitled Condemned 2 in Europe and Australasia) is a video game developed by Monolith Productions and published by Sega for the PlayStation 3 and Xbox 360. It is the sequel to the 2005 game Condemned: Criminal Origins. Players assume the identity of Ethan Thomas, the former Special Crimes Unit investigator, who’s been called back to duty to track down Malcolm Vanhorn, the uncle of Leland Vanhorn aka "Serial Killer X" from the previous game. Malcolm sent a message to S.C.U. for Ethan, desperate to find him. However it is soon discovered that Malcom has been murdered and completely sliced open with his vocal cords removed. Condemned 2 begins soon after the events that occurred in the previous installment, Condemned: Criminal Origins. The many strange and unexplainable things that happened to Ethan in the past have left him a desperate burnout, homeless, and a drunk. Ethan is now prone to many more hallucinations and strange visions that are mostly made up in his mind. It has been confirmed that the fact that Ethan has become an alcoholic will somehow be played into the storyline, such as when the player aims down the sight of a firearm, Ethan's arms will be unsteady. To remedy this the player will have to drink liquor which will "calm his nerves" temporarily. Late into the game Ethan will have to fight his alcohol demon. Greg Grunberg does not voice Ethan in Condemned 2, mostly due to the personality change. Instead, he will be voiced by Andre Sogliuzzo. This page was last edited on 8 July 2016, at 20:03.